With just 60 minutes between themselves and the All-Star break it would have been easy for the Bruins to daydream their way through the game and come away with a lackluster effort but the Bruins came out hot, got a two-goal lead early and hung on in the final frame for a 2-1 win over the Panthers. The win extends the Bruins lead in the Northeast to four points heading into the break. Tim Thomas was especially good in net while Milan Lucic and Brad Marchand did all the scoring. The Bruins started the game just as you’d hope a team would start against a team they’ve beaten three times before. The Bruins exploded out of the box with fast skating and a bevy of chances. Tomas Vokoun made up for his teams lack of defensive urgency by standing tall between the pipes, keeping the game knotted early on. The Bruins momentum early on was helped by a high-sticking penalty on noted Bruins killer Christopher Higgins. Although the Bruins didn’t score their advantage in skill became evident and they started to really find their legs. The Bruins hard work didn’t pay off in the first half of the period. 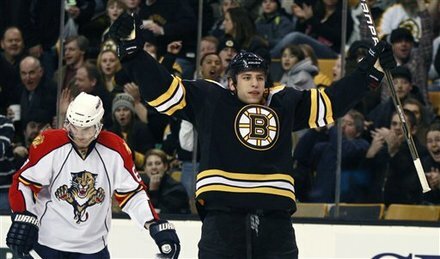 The Bruins would open the scoring when Brad Marchand wrapped home a goal on a down and out Vokoun. Patrice Bergeron found Marchand in stride and the grinder took the puck on a tour of the zone, wrapping around the net from glove side to blocker side. Vokoun had put himself out of position early on and could only reach back from his stomach by the time Marchand reached the post. The puck just got past the goal line before Vokoun stopped it. The first period was also highlighted by a scary moment involving David Krejci. Krejci was checked in a vulnerable spot and fell awkwardly into the boards, immediately grabbing at his shoulder and noticeably wincing. Milan Lucic tried to retaliate by pushing and a small scrum ensued. Krejci eventually got up and skated off, holding his arm all the way down. Thankfully, Krejci would return to the ice shortly after. Th first period began with the Bruins continuing to dictate the pace of the game. After some sparkling saves from Tim Thomas early in the period Milan Lucic gave the B’s a two-goal cushion when he snapped home a wrist shot off of a faceoff. Krejci, showing no ill effects from the previous hit, won a faceoff clean back to Lucic and then held off long enough to create a shooting lane which Lucic fired through for his 20th goal of the season. The Bruins did a good job of protecting Thomas after some good Florida chances early on. Many shots began to come from the outside and were easily snubbed. On the other side of the ice the Bruins began to pepper Vokoun and keep play in his zone for long stretches. But although they threatened to put the game out of reach they couldn’t beat Tomcat for a three-goal cushion. The Panthers began to show some life in the third period, getting better shots on Thomas and controlling the play pretty well early on. Their hard work resulted in the first Florida power-play of the game early in the third. The Bruins did a great job in killing the penalty, rarely allowing the Panthers to enter the zone, never mind set up camp for any duration. The Panthers would get on the board shortly after when Bryan Allen cut the lead in half at a critical time. The play came off a pretty innocuous looking play when a blast from the left side was blocked down by Thomas but rebounded perfectly to Allen on the right side who stepped into what essentially was a one-timer, beating Thomas high. Despite the strong penalty-kill the goal had come after Florida built a lot of momentum in the third period. As dominating as the Bruins were in the second period, it seemed that the Panthers were equally as dominating in the third period. The Panthers began to press as the clock started to become their enemy but the Bruins defense did a good job of clearing the puck when need be and the Bruins forwards did a good job of working the puck in the two zones furthest from their net. The Panthers waited a long time to pull their goalie and finally did with about 75 seconds left. The Bruins kept the puck on the perimeter and then did a good job of ragging time in the neutral zone with good forechecking. The Panthers threatened in the final seconds but Thomas stood tall in his crease. The Bruins go on the All-Star break on a high note with a 2-1 win, extending their lead to four points in the Northeast.